In my last Weekend Cooking post, I talked about how I find looking through relevant magazines and cook books really helps in getting and keeping my head into the right place for weight loss. Each time I receive a new magazine I spend a long time reading through the recipes and the stories and then go through it again and again. Eventually I will actively choose recipes that I think I want to try. This is one that jumped out pretty quickly from the July/August issue, and just like last week's recipe it was one that I made twice within a few days because it was such a hit. Well, and also because I had all the ingredients on hand and only had to buy an onion to make dinner. In fact, when I had the discussion with the boy to determine what he might like to eat for this week, this was the only thing he asked for again which would make it three times in less than two weeks. Confession time. Until a few weeks ago I had never made any kind of green curry from scratch. I recently made a recipe from the Symply Too Good to be True cookbooks which I might share another time but having made that I felt that I could try and make this version without too much difficulty. It is actually a pretty easy recipe although preparing the filling does take a little time. The other recipe is probably lower calories but I must confess that I have really enjoyed being able to have some pastry without feeling too guilty. Preheat oven to 210C (fan-forced). Line an oven tray with baking paper. Put a rectangular 750ml (3 cup) ovenproof dish on prepared tray. Heat oil in a medium non-stick saucepan over a medium heat. Add onion and cook, stirring occasionally, for 7 minutes or until onion begins to soften. Add curry paste and cook, stirring for 1 minute. Add flour and cook stirring, for 1 minute. 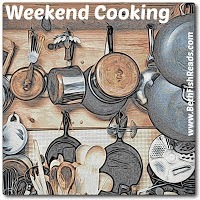 Remove pan from heat and gradually whisk in combined stock powder and water until sauce is smooth. Add coconut milk and milk, and whisk to combine. Return pan to stovetop and cook, stirring over a medium heat for 3-4 minutes or until the mixture thickens and comes to a simmer. Remove pan from heat, Add chicken, broccoli and spinach, and stir to combine. Spoon mixture into the prepared dish. Lay pasty sheet on a clean surface. Cut 4 x 1 cm thick strips of pastry from the perimeter of the sheet. Brush rim of dish with a little egg and press pastry strips around the rim. Brush with egg. Top with remaining pastry, rolling out slightly, if needed, to fit. Trim edges. Brush with a little egg. Cut a few small slits in the top of the pastry. Bake for 18-20 minutes or until pastry is golden brown. Serve pie with salad leave. There is also a suggestion that you could make a fish pie by replacing the chicken with boneless fish fillets and the green curry past with red curry paste. The teenage boy would not be a huge fan but it might be something I might try in future. I will say that the pie actually looks huge so it isn't like it isn't a generous serving for two. 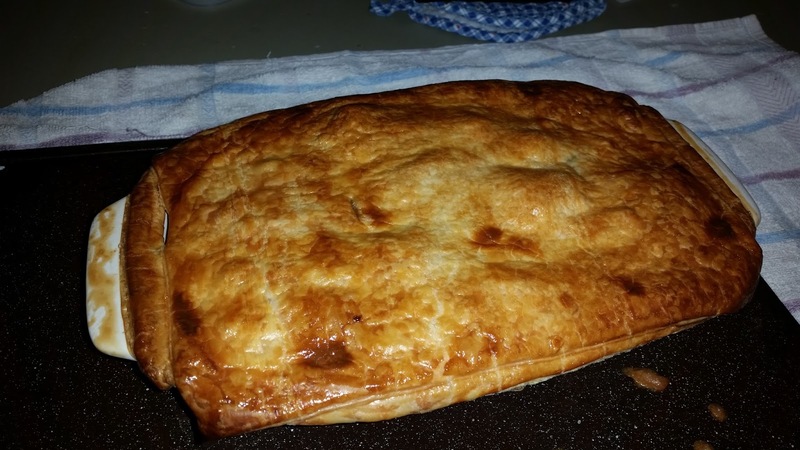 The first time I made this I stuffed up the pastry so I had some leftovers. Just because I could I made a really quick free-form apple pie using fresh apple. By free-form I mean that thing was messy, messy, messy but it tasted good. This was a hit with the boy, and during the course of the week he made himself another couple of pies. I did laugh though because, when I made it, it was some apple and cinnamon shoved in the middle of some pastry with the uneven sized edges folded in. His pie was beautifully presented with plaited pastry and looked very professional. Then the second time he made a pie this is what he presented. I would point out that this was all for him though!! It's fun to look at these and think about the tasty delights under the pastry. Yum! 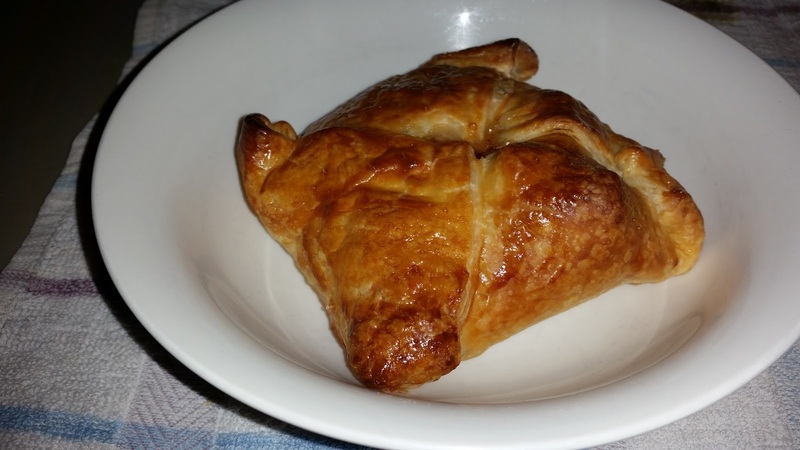 Delicious looking pastry, savory and sweet! Yum! I love chicken curry but never had it this way! Yum! I love anything with pastry and both the green curry and the apple version sound delicious! Pretty much anything with puff pastry is a winner in my book. And that apple version looks awesome! Yum - never thought to make a curry in a pie - combines two things I love! The apple pie looks wonderful.